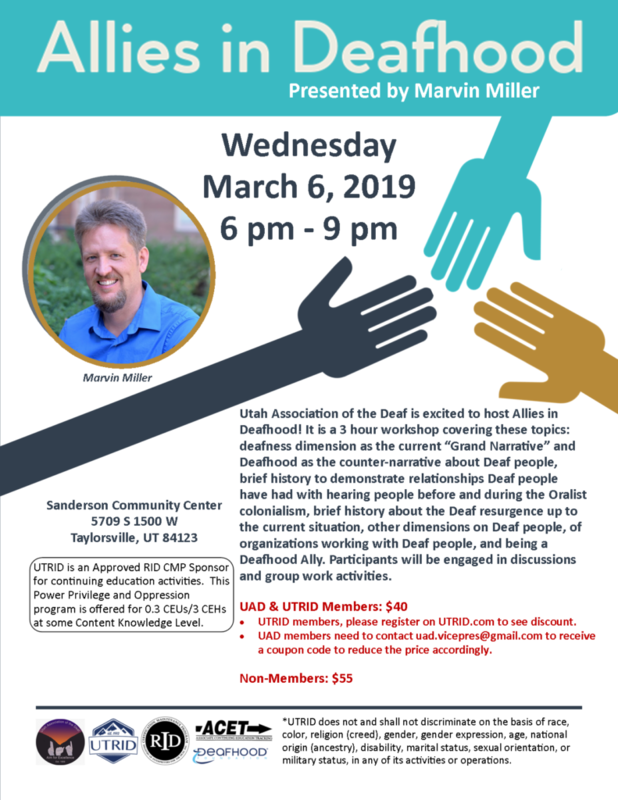 Utah Association of the Deaf is excited to host “Allies in Deafhood”! This is a 3 hour workshop designed for hearing people who are interested in learning how they can become a great ally for Deaf people. Contents of workshop includes differences between deafness vs Deafhood, why we use application of “colonialism” in the understanding of our individual and collective experience/ history, an expanded definition of Audism, and what the Five Dimensions of Deaf people are. You can get CEU and/or CEHs for this! For further info related to this, please look at the flyer attached. Registration fees and information is also on the flyer.